During its half a century as the fastest commercial plane on earth, the Concorde flew faster than a rifle bullet; its maximum speed was twice the speed of sound (2180km/h). The Concorde left the runway for the first time on March 2, 1969 and officially made its first service flight on January 21, 1976—before eventually retiring on October 24, 2003. It could fly from New York to London in roughly three hours, for those passengers able to afford the exorbitant ticket prices. (A one-way ticket in 2002 on the British Airways Concorde cost $8,800.) The plane was eventually retired due to the cost of operation (along with other current events like the Air France Concorde crash from Paris in July 2001 and 9/11 in 2001, which put customers off flying). 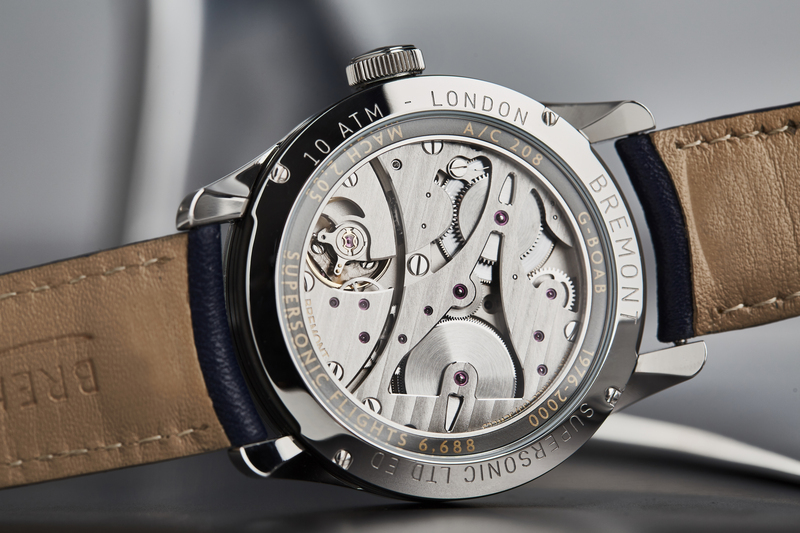 But for those that did get to step foot aboard the Concorde or for those looking to own a piece of aviation history, Bremont has partnered with British Airways to offer a limited-edition watch made with pieces of the historical aircraft. It also happens to be a landmark year for the commercial airliner this year—British Airways will be celebrating its 100th anniversary on August 25, 2019. Thanks to British Airways, the Bremont Supersonic contains aluminum from the G-BOAB Concorde, known as Alpha Bravo, that has been machined into a decorated ring within the case back beneath the crystal. The ring also has the number and registration, years of active service, and the number of supersonic flights flown, as well as the top speed of the airliner. The Alpha Bravo was first registered in 1974, the year British Airways was founded, and two years before the first commercial Concorde flight took off. In May of 1976, it flew from Filton near Bristol to Fairford in Gloucestershire, England in three hours and 32 minutes. It was the third Concorde to be part of the British Airways fleet and one of 14 to be entered into service during the history of the supersonic plane. The watch contains more than a piece of aviation history though, it also contains a piece of Bremont history—the watchmaker’s first-ever manual wind movement with an eight-day power reserve and a power reserve indicator at 12 o’clock. The aesthetic of the watch, meanwhile, was meant to imitate the retro feel of the timepieces of the era of Alpha Bravo with a sunburst silver white metal dial, which is also the color of the Concorde’s reflective paint, and the blue hands mimic British Airway’s signature blue on the livery. The watch will be limited to just 300 pieces in steel (around $17,500), 100 in white gold (around $33,500), and 100 in rose gold (around $31,250). Part of the proceeds of the sale of the watches will be donated to the Air League Trust, an organisation that works with British Airways to inspire the next generation to learn how to fly.